Did anyone else think the Newsweek photo of Oprah was Misogynistic? And just plain dumb? Does Bad Economic News Equal Good News For Women? You are not alone. Finally here is a book that gets to the heart of what professional women want. You've probably been loath to admit, but like most of us, you have had enough of the sixty-hour workweeks, the day-care dash, and the vacations that never get taken. You don't want to quit, you want to work -- but on your own terms and in ways that make it possible to have a life as well. Women have power. In Womenomics, journalists Shipman and Kay deal in facts, not stereotypes, providing a fresh perspective on the largely hidden power that women have in today's marketplace. Why? Companies with more women managers are more profitable. Women do more of the buying. A talent shortage looms. Younger generations want to work flexibly, too. It all adds up to a workplace revolution that is great news for professional women -- not to mention men and businesses as well. As Brenda Barnes, CEO of Sara Lee, notes: "Companies need to recognize that this kind of flexibility offers employees the ability to manage and balance their own careers and lives, which in turn improves productivity and employee moral." This new way of thinking and working is all the more valuable in a recession, as companies begin offering flexible schedules, four-day workweeks, and extended vacations as a way to avoid layoffs, save costs, and still reward employees. It is personal. Womenomics does more than marshal the evidence of this historic shift. It also shows women how to redefine success, be productive, and build satisfying careers that don't require an all-or-nothing lifestyle. Most appealing are the candid personal anecdotes from Shipman's and Kay's own experiences and the stories they have gathered from professional women around the country who are coping with the same issues. It is possible. Shipman and Kay don't waste time on what women can't do or can't have. Instead, they show women how to chart an empowering, exhilarating course to a richer life. 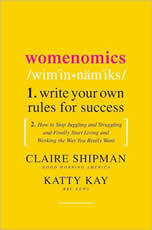 Inspiring, practical, and persuasive, Womenomics offers a groundbreaking blueprint for changing they way you live and work -- with advice, guidance, and fact-based support that proves you don;t have to do it all to have it all.